Some High Level Sports – Twisting and tearing of cartilage, high impact. For knees the greatest risk is Weight Gain and prolonged Sitting. The weight crushes the cartilage and the lack of lubrication from sitting helps it to rust out a lot faster. Joints must be used to be preserved. They need to be Lubricated. Muscle needs to be strengthen to support the joints [ not to look good ]. You don’t wear them out going for an hour walk or a jog in the park. You wear them out usually from one or more of the above list. Think of your joints as a Barn Door Hinge leave them unattended for long enough and they stiffen up, rust through, and no matter how much you oil it after, it’s too late, they’re too far gone, they need replacing. 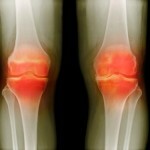 There is no known cure for Osteoarthritis, only Prevention, Management, Replacement. Doing nothing accelerates the decay. Doing too much causes pain and discomfort and accelerates it as well. Don’t ignore pain, treat it early, pain is your indicator that something is wrong.